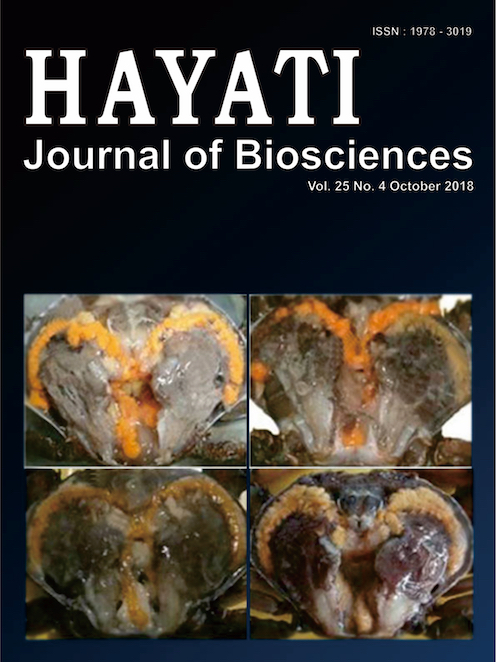 HAYATI Journal of Biosciences (HAYATI J Biosci) is an international peer-reviewed and open access journal that publishes significant and important research from all area of biosciences fields such as biodiversity, biosystematics, ecology, physiology, behavior, genetics and biotechnology. All life forms, ranging from microbes, fungi, plants, animals, and human, including virus, are covered by HAYATI J Biosci. HAYATI J Biosci published by Department of Biology, Bogor Agricultural University, Indonesia and the Indonesian Society for Biology. We accept submission from all over the world. Our Editorial Board members are prominent and active international researchers in biosciences fields who ensure efficient, fair, and constructive peer-review process. All accepted articles will be published on payment of an article-processing charge, and will be freely available to all readers with worldwide visibility and coverage. HAYATI J Biosci has been also indexed/registered in SCOPUS, Asean Citation Index, DOAJ, SINTA, National Library of Medicine Catalog, Crossref, ROAD, CABI, EBSCO, Publons, Scilit, Agricola, ProQuest and others. From October 2015, HAYATI is hosted by Elsevier and available free of charge through Science Direct. Starting May 2017, HAYATI J Biosci is included in SCOPUS database/index.